The Gods Walk the Earth! 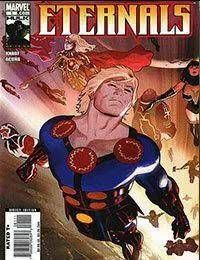 In ancient times, the Celestials, a race of cosmic giants, came to Earth and created a race of powerful immortal beings: The Eternals! For a time, primitive man worshiped them as gods, but eventually they disappeared. Now, they have returned! One of the Celestials now towers over Golden Gate Park, standing in judgment over the Earth… but does he bring the end of the world?